Many products on the market today that are labeled as colloidal silver actually consist mostly of ionic silver. Monatomic colloidal silver is another name for ionic silver. Silver Hydrosol is yet another name for ionic silver. Those mostly ionic products advertised as colloidal silver never mention the words ionic silver in their literature or specify what percentage of the total silver in their product is silver ions vs. silver particles. They don't bother to tell you that their product is mostly ionic silver, not silver particles.The fact is, most such products only contain between 1% to 20% (10% typical) of their silver content in the form of silver particles with the majority 80% to 99% in the form of ionic silver. Ionic silver is not the same as metallic silver nanoparticles . For example, metallic silver is not water soluble (does not dissolve in water) but ionic silver is water soluble (it does dissolve in water). Technically speaking, a silver ion is an atom of silver that is missing one electron. It is the outermost electrons of an atom that determine the physical properties of matter. Take away one electron from a silver atom and you get a silver ion which is water soluble. In its ionic form, silver is highly reactive with other elements which means it will readily combine to form compounds. Ingestion of highly concentrated forms of ionic silver (having a silver concentration of 100 ppm and above) could potentially cause a condition called argyria, a permanent discoloration of the skin. For those who are interested in the more technical aspects and want to understand the technical terms involved, see the extensive Definition of Terms. Also see the FAQ for answers to common questions about ionic silver. For a more technical discussion about the differences between ions and particles, see Ions, Atoms and Charged Particles. Because a true silver colloid consists of silver nanoparticles, not ions. Inside the human body ionic silver quickly combines with chloride to form an insoluble compound called silver chloride which is far less reactive than metallic silver nanoparticles. In fact, ionic silver cannot survive inside the human body. In the digestive tract hydrochloric acid supplies the chloride ions that cause ionic silver to quickly form silver chloride. If some ionic silver were ever able to get into the bloodstream it would encounter a large supply of chloride ions owing to the fact that blood serum is rich in sodium and potassium chloride, again quickly forming silver chloride. Only silver nanoparticles can survive inside the body. Read the detailed study that proves that stomach acid destroys the effectiveness of ionic silver in a study that tested the Effects of HCL (Stomach Acid) on Colloidal and Ionic Silver. Silver chloride is a compound that is formed when silver ions combine with chloride ions. It is an insoluble compound which means once it is formed in the human body, it remains as a compound and does not dissolve. Silver ions and chloride ions have such a strong attraction for each other that it is almost impossible to keep them apart. Once they find each other they form the silver chloride compound. Because ionic silver forms silver chloride inside the human body it cannot exist as a ionic silver for more than a few seconds. This means that all ionic silver will turn into silver chloride once inside the body. Silver chloride is eliminated by the kidneys and expelled through the urine, but it also has its dangers. Not only does it fail to provide the benefits that colloidal silver is known for, but more importantly, ingestion of highly concentrated forms of ionic silver having a silver concentration of 100 ppm and above can potentially cause argyria, a permanent discoloration of the skin. Metallic silver nanoparticles are unaffected by chloride ions and will circulate in the bloodstream where it is believed they work their magic. The particles will slowly be eliminated from the body and do not build up. Since it is the nanoparticles that have been reported to do the important work, it is important to know how much of the colloidal silver product is in the form of nanoparticles. The nanometer size particles of metallic silver that comprise Mesosilver will not cause argyria. How much of the products is actually silver nanoparticles? A typical colloidal silver product that is 10 ppm (parts per million) of total silver has 90% of the silver in ionic form and only 10% in nanoparticle form. That means you are getting only 1 ppm of silver nanoparticles in a product advertised as 10 ppm. That is assuming 10% particles. The products that are only 1% nanoparticles, would yield only 0.1 ppm of nanoparticles. It is easy to see that for the greatest effectiveness you want to look for a product that has most of the silver content in the form of nanoparticles not ions. Colloidal silver that is mostly ionic silver looks just like water. It is clear and colorless because silver that is dissolved in water looks just like sugar or salt that is dissolved in water; it looks just like water. Colloidal silver that has a high concentration of silver particles does not look like water because silver particles, even very small particles block light from passing through, making the liquid appear darker. The producers of ionic silver solution will tell you that colloidal silver should look like water. That is because that is what their product looks like. They just don't know how to make a true colloid. You can be sure those companies would be supplying a higher nanoparticle concentration product if they knew how to make it. Why is ionic silver so prevalent ? Most products are ionic silver because it is very simple to make. So simple, in fact, a child can do it. All it takes to make ionic silver is a nine volt battery and some silver wire. It is simplicity in the extreme. Most producers do not use a nine volt battery, but a high voltage AC source because it makes a more stable ionic solution. The high voltage AC product is just as simple to make, but takes a little more equipment. In either case, the process is a form of electrolysis. The electrolysis process produces mostly ionic silver and is the process by which the vast majority of companies are producing what they call colloidal silver, but in fact it is mostly an ionic silver solution. It is just like calling a beverage orange juice when it only contains 10% real orange juice and 90% something else. Regardless of claims made to the contrary, if the product is made by electrolysis, it not a true colloid, it is mostly ionic silver. By comparison a true colloid has a high concentration of particles and little or no ionic silver. To make a true colloid is difficult in the extreme. That is why there are so many ionic silver products and only one Mesosilver. To find out the actual ionic silver content of selected products see the Product Reports . Remember, if it looks like water, it is ionic silver, not a true colloidal silver. For more on this subject be sure to read When is colloidal silver not a colloid? But that is not the whole story! While it is easy to understand why the percentage of silver particles is important, that is only half the story. Of additional importance is the size of the particles. For a given concentration of silver particles, the total surface area of the particles goes up as the size of the particles gets smaller. It is the total particle surface area that determines the overall effectiveness of a colloid. In this context, effectiveness is defined as the ability of the colloid to interact with its environment. The more surface area of silver that is exposed to the environment (bloodstream) the more effective it will be. For a more detailed discussion of particle size and particle surface area see Colloidal Silver Effectiveness. For a comparison of the particle surface area values for selected products see the Comparison Table. It is the combination of small particle size and high particle concentration that produces the maximum effectiveness for a colloidal silver product. The only product offering this magic combination of properties is Mesosilver. Mesosilver is the only product whose silver content is specified in terms of the ppm concentration of the silver particles. Other products only specify total silver content without telling what percentage is ionic vs. silver particles. Mesosilver is the only product whose particle silver content is typically 80% of the total silver. It is mostly particles, the others are mostly ionic. Mesosilver is the only product that proves the size of its particles by publishing the particle size distribution plot produced by laboratory equipment designed specifically to make such a measurement. Mesosilver is the only product that publishes the value of it's particle surface area which is up to 600 times greater than other products. No other colloidal silver looks like Mesosilver, and no other product performs as well as Mesosilver. There is only one Mesosilver, and there are no others like it. 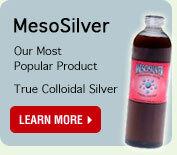 Order your Mesosilver today and start getting the benefits only a true colloidal silver can provide. Satisfaction Guaranteed (See Guarantee for details) - If you are not absolutely pleased with the results we will gladly refund your money. See Price List page for pricing and quantity discounts. ORDER HERE using our secure server or toll free 24-7 Order Desk.